Finally the rivers seem to have quietened down andÂ angling pressure is back to normalÂ to with the odd tourist and the odd local wandering up the river bank. Easter was extremely busy on our local rivers and I really struggled with guiding on the Tongariro as by the time I got there most of it was picked over. Those who did well either knew the river extremely well or were up at the crack of dawn racing the crowds to the pools, things should have settled down now and you should expect some good sport in the weeks to come. Taupo received some lovely rain a couple of nights ago but unfortunately it just was not enough to make much of a difference to the river levels but a bit is better than none and we will take anything we can get at the moment. 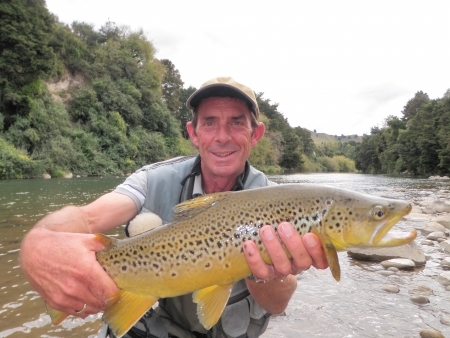 I fished the Mohaka today and this catchment seems to have received a fair bit more rain than us in the last week as the river was cloudy and almost un fishable,thankfully the Waipunga was perfect? AsÂ mentioned in my last blog I have my Father here at the moment and as he isÂ a mad keen fisho as wellÂ so I have been trying to get him out on some of the water that I guide on. Easter Sunday wasÂ a very quiet day on the stretch of river we fished as I was able to get into some semi private water thanks to some very good friends and show Dad some awesome fishing. 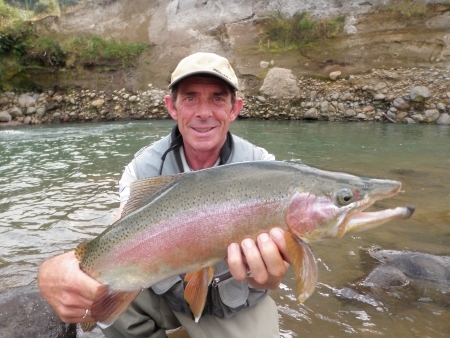 Dad and I fished both the Whakapapa and the Whanganui which were both low and clear but with the right gear fished very well. Lucky to have all the water to ourselves we slowly stalked all the obvious lies and pulled fish from most with very small natural nymphs which they took with anger. 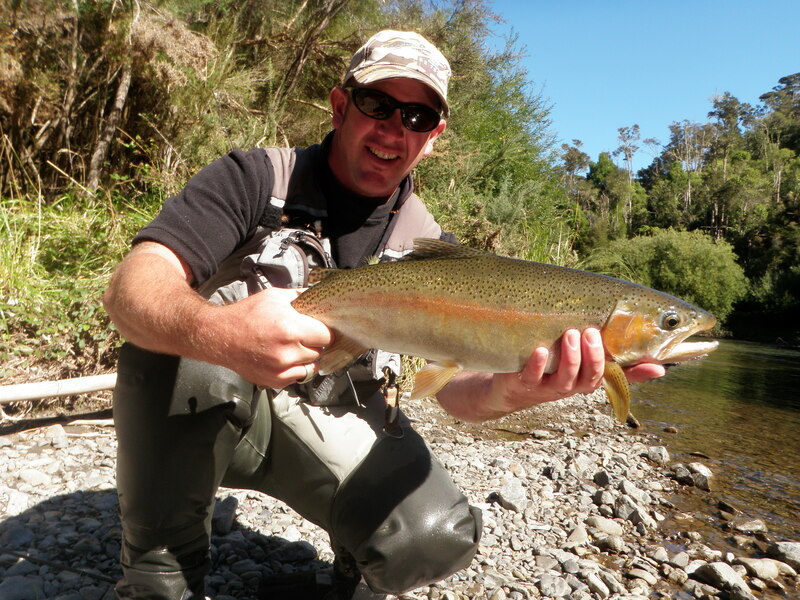 The Whakapapa produced the largest trout which was just under 7lb and after running down two sets of rapids we finally managed to secure a picture and a quick release for another day. There are a few places on this beat which continually produce fish and at times I’m shocked when the indicator is not yanked under. The fish quality at the moment is perfect and is a fly fisherman’s heaven which always brings me back to wonder why anglers can still be allowed to spin fish and kill their catch in this fragile fishery. 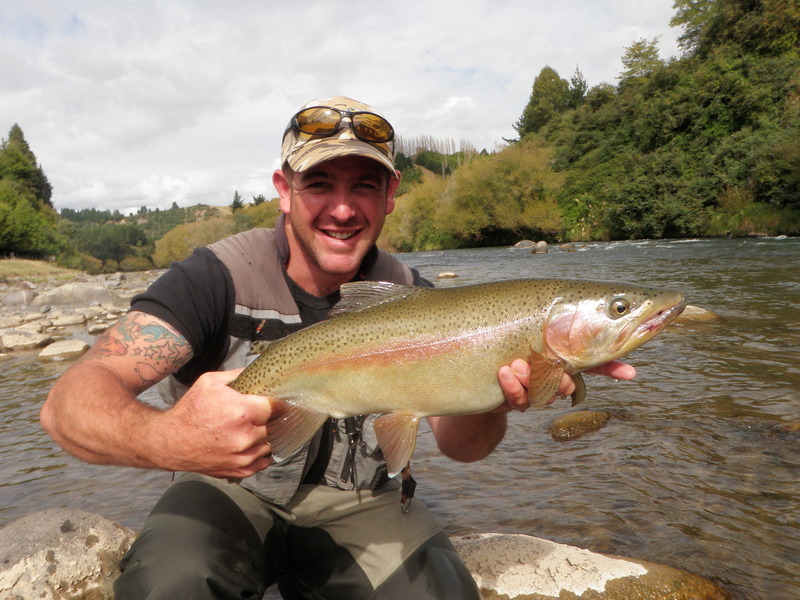 The Whanganui still has some of the hardest fighting fish in the North Island and it is not a surprise to me that it is one of the most fished water in the country. 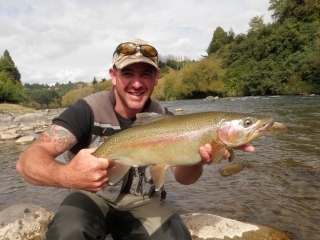 With spin fishing and BAIT fishing being legal in this fishery we are lucky it isÂ a massive river as it would surely not be able to handle the pressure that it receives and still continually pump out great numbers of perfect fish. Dad and I again fished a very special piece of water with good numbers of fish both fat hens and randy jacks taking small naturals using nymphing methods. The fish at the moment seem to be stacking up in the larger pools ready for spawning as their stomachs are fat with eggs and spawning colours bright. The next month or so will be good on backountry rivers just make sure they are still open before planning a trip to them as some are starting to get to the end of their sporting season. Just a short quick blog tonight so I hope you enjoy the photos as much as we enjoyed finding them for you.